GOLD, the bulls are on the move! And, it seams that they don’t expect the rate hike tomorow!? 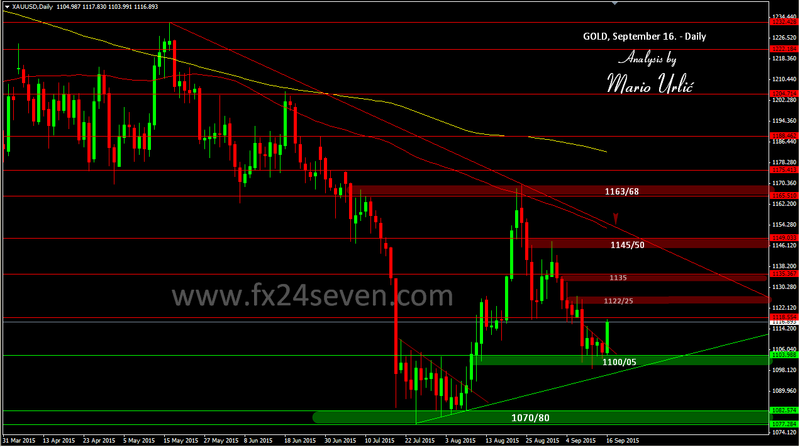 The gold has finaly move from 1100 level, where the precious metal has find a decent buyers in the last 6 days. Started the day at 1104, the gold is reached high for now at 1118.60, the previous support from August and begining of September. It seams that that level could be broken today easy, with next target for the bulls at 1122/25. The last datas from the US is showing some ‘slow motion’ in the US economy and that was probably the trigger for this move up. Let’s see what the bulls can do and how will they react tomorow if FED stays at no change monetary policy. It could be the blast here, the 1145/50 could be attacked tomorow! How do you see this traders?